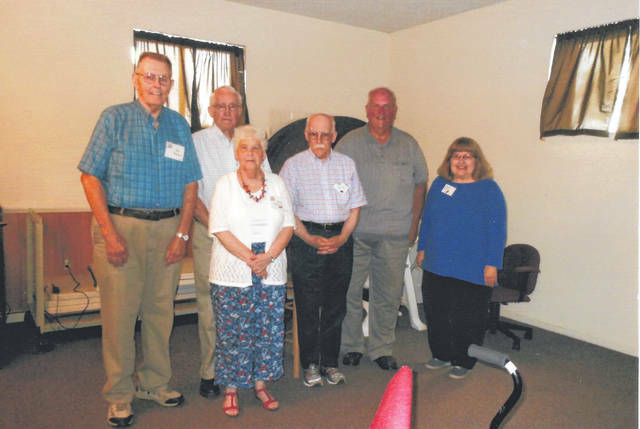 CCRTA members who are former teachers in Mechanicsburg Schools include, from left, Ted Berlin, Carl and Judy Pilkington, Colvin Bear, Glenn Lewis (speaker and substitute teacher) and Carol Nance. The Champaign County Retired Teachers Association met at the Urbana Church of the Nazarene on Tuesday, August 14. President Linda Fullerton opened the meeting with prayer and the Pledge of Allegiance. Following the luncheon, Fullerton introduced Glenn Lewis, former teacher and principal in the Graham Local Schools. Lewis presented an informative overview of the history of the Mechanicsburg Exempted Village Schools. The topic was “The Twenty-five Facts You Probably Don’t Know About Mechanicsburg.” His speech included a power point presentation with photos of the various buildings and points of interest. Especially fascinating were the many residents whose names have been well-known nationally. The business meeting included several reports. Scholarship contributions to date were given, and Colvin Bear discussed the Legislative bills under consideration. A moment of silence was observed in the memory of members Sheryl Lee Virts and Ronnie Releford. Volunteer hours to date were announced by Janet Ebert. She also mentioned the coverage of the last meeting and inclusion in the Community Calendar by the Urbana Daily Citizen. Ebert also apologized for the mistake in identifying Ruth Harmon as Ruth Knight in the photo with UU Executive Vice President and Provost Christopher Washington. The next meeting of the CCRTA will be held on Tuesday, October 9 at 11:00 A.M. in the Church of the Nazarene at Route 29 and Dugan Road. The luncheon will be catered by Amy’s Catering. Submitted by the Champaign County Retired Teachers Assn.